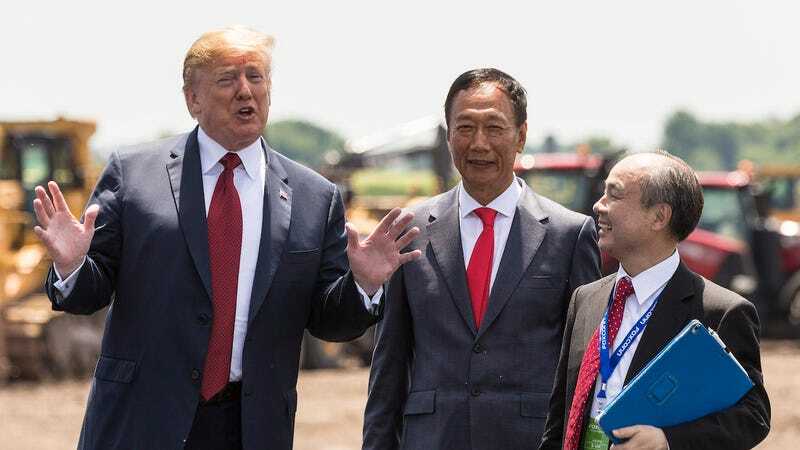 President Trump with Foxconn CEO Terry Gou and Masayoshi Son, chairman and CEO of SoftBank Group at the groundbreaking for the Foxconn factory on June 28, 2018 in Mt Pleasant, Wisconsin. Foxconn, one of the largest electronics manufacturing companies in the world, received $4 billion worth of subsidies and infrastructure spending from the state of Wisconsin to build a new factory there. But the plan for that factory seems to be unraveling by the day. In fact, Foxconn now admits that they’re no longer building a factory in Wisconsin, as first reported by Reuters. “In Wisconsin we’re not building a factory. You can’t use a factory to view our Wisconsin investment,” Louis Woo, a special assistant to Foxconn CEO Terry Gou, told Reuters. Taiwan-based Foxconn told Gizmodo via email that the company has made an “adjustment of plans” because “the global market environment that existed when the project was first announced has changed.” The company will reportedly still hire “engineers and researchers”—the plan was originally hailed as a great opportunity for manufacturing workers. Foxconn, which famously manufactures Apple’s iPhone, had originally planned to build a 20-million-square-foot campus in southeastern Wisconsin that was supposed to employ as many as 13,000 people. No one knows anymore how large the campus might be or how many people Foxconn will ultimately employ in Wisconsin. Foxconn initially planned to hire roughly 5,200 people by 2020, but it’s reportedly not on track to reach that figure. 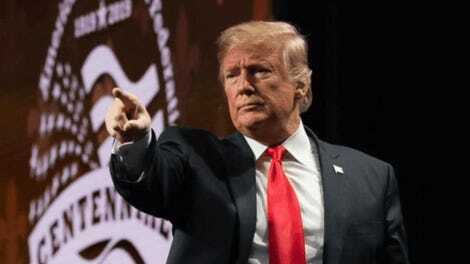 The company hired just 178 people of its stated goal of 260 hires last year, which means the state doesn’t have to fork over the $9.5 million it promised if the company met the 260-job threshold, according to Reuters. When the factory was first announced in 2017, Foxconn initially said that it would manufacture TV screens. President Trump even visited the site with Foxconn CEO Terry Gou on June 28, 2018, to tout the factory as a great American success story. Then in August, news broke that Foxconn had downgraded the type of factory it planned to build to one suited for the manufacturing of smaller screens. Now there won’t be a factory built at all. “While the project’s focus will be adjusted to meet these new realities, the Wisconsin project remains a priority for our company,” a Foxconn representative told Gizmodo. But that’s not sitting well with the people of Wisconsin. Especially Democratic lawmakers who opposed former Governor Scott Walker’s plan to give so much money to Foxconn. “This is not surprising to anyone who has followed Foxconn overpromise and underperform on a number of their international projects,” Democratic state Representative Gordon Hintz told Gizmodo over the phone. “Of course, today’s announcement reflects what people have known... that this type of manufacturing has not been viable in the U.S.,” Hintz said. Hintz said that even if the state winds up paying out less money to the company as the project is scaled back, there are plenty of sunk costs, and people have already been displaced from their homes. The state has attempted to oust people in the area through eminent domain. And to make matters even worse for taxpayers, the people of Wisconsin are still on the line for a bunch of money—the exact total is not yet known—even if Foxconn only delivers a fraction of what it promised. “The public in Wisconsin has been duped. I think Republicans made a reckless decision. The rationale for Foxconn—it was always worth it for them if they could maintain open markets in the U.S. for what they produce,” said Hintz. But if there’s any silver lining it’s that Foxconn seems to be engaging with lawmakers and the public in a more straightforward way ever since Walker was voted out in 2018. Tony Evers, a Democrat, is now Wisconsin’s governor.